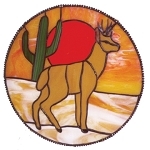 Make this Southwest inspired stained glass suncatcher, courtesy of Diamond Tech. This versatile design is easily converted to use in stepping stones, panels or medicine wheels. The free project guide offers detailed instructions and pattern. Follow the link below to download.